This came from the most recent Uncork New York publication. Thought you should know…hopefully Lakeland Winery’s wines will be able to compete in the future. Always keep in mind, even if it’s “Best of Show” doesn’t mean you need to like them. It just means every single judge felt it deserved a gold medal, and more. And never feel ashamed you can’t taste the difference between what you like and what other so called experts like, because your preference is personal. That’s one thing I’ve learned: You may love it but the person standing next to you will make a face that sends a different message! 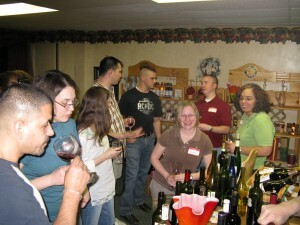 Please be patient, your appreciation of different wines will change as you explore a larger variety of wines. NEW YORK GOLD keeps flowing in, most recently from the International Eastern Wine Competition, one of the countryâ€™s oldest and largest judgings, this year with 2,250 entries. New York won a total of 245 medals, topped by the Casa Larga 2005 Vidal Ice Wine (Best of Show Dessert Wine), Rooster Hill 2006 Semi-Dry Riesling (Best of Class), and the Peterson family-owned triad of Goose Watch, Penguin Bay and Swedish Hill racking up 3 Double Golds, 5 Golds, 16 Silvers and 14 Bronzes. Their Double Golds were Goose Watch 2007 Traminette, Penguin Bay 2007 Pinot Grigio and Swedish Hill Blanc de Blanc, accompanied by Golds for Goose Watch 2007 Viognier, Penguin Bay 2007 Gewurtztraminer and Percussion, and Swedish Hill Blue Waters Riesling and 2007 Cayuga White. Other New York Double Golds went to Cayuga Ridge 2006 Cayuga White, Dr. Frank 2005 Merlot, Eagle Crest 2006 Cayuga White, Earle Estates Apple Enchantment, and Sheldrake Point 2007 Riesling Ice Wine. Other Golds went to Brookview Station 2007 Whistle Stop White (Apple Wine), Jamesport 2005 Pinot Noir, Keuka Spring 2006 Crooked Lake Red, Lieb 2006 Pinot Blanc, Lucas 2007 Dry Dock, Peconic Bay 2005 Chardonnay, Red Tail Ridge 2006 Barrel Fermented Chardonnay, and Ventosa Vineyards 2005 Cabernet Franc and Tocai Friulano. Perhaps most significant, out of 250 New York wines entered, 245 won medals (only five did not), reflecting the â€œquality revolutionâ€ in New York across the Board in terms regions and varietals.